The global market for specialty feed additives was valued at USD 7.74 Billion in 2015; this is projected to grow at a CAGR of 5.43% from 2016, to reach USD 11.12 Billion by 2022. The main objectives of the report are to define, segment, and project the size of the global specialty feed additives market with respect to type, livestock, function, form, and region; provide detailed information regarding the key factors influencing the growth of the market; and strategically profile key players and comprehensively analyze their core competencies. This research study involves the extensive usage of secondary sources—Food and Agriculture Organization of the United Nations (FAO), FEFANA (EU Association of Specialty Feed Ingredients and their Mixtures), and International Food and Agribusiness Management Association (IFAMA)—to identify and collect information useful for this technical, market-oriented, and commercial study of the specialty feed additives market. The primary sources are mainly several industry experts from core & related industries and preferred suppliers, manufacturers, distributors, service providers, reimbursement providers, technology developers, alliances, and standard & certification organizations related to all the segments of this industry’s value chain. In-depth interviews have been conducted with various primary respondents, including key industry participants, subject matter experts (SMEs), C-level executives of key market players, and industry consultants among other experts to obtain & verify critical qualitative & quantitative information as well as to assess future prospects. The value chain of specialty feed additives begins with R&D and product development, in which the selection of source and the quality of the product are determined by the requirement of the product. The value chain helps in bringing about coordination among stakeholders such as BASF SE (Germany), Evonik Industries (Germany), Novozymes (Denmark), Nutreco N.V. (Netherlands), and Alltech Inc. (U.S.). The palatability enhancement segment dominated the specialty feed additives market in 2015. The North American specialty feed additives market was dominant in 2015. Detailed company profiles of key manufacturers of specialty feed additives. With the given market data, MarketsandMarkets offer customizations according to the client-specific needs. 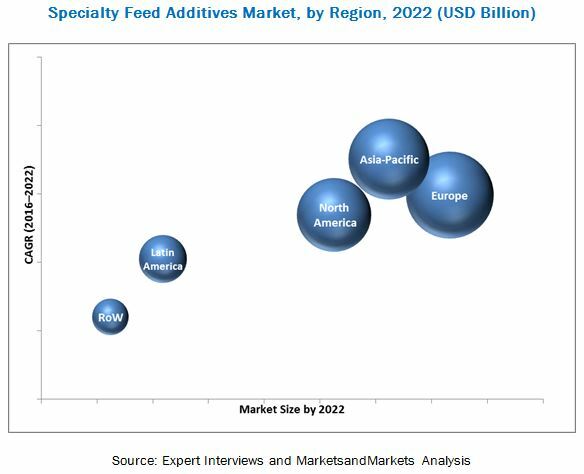 The size of the market for specialty feed additives is projected to reach USD 11.12 Billion by 2022, growing at a CAGR of around 5.43% from 2016. The global specialty feed additives market has grown exponentially in the last few years. Increase in consumption of animal products, rise in incidences of disease outbreaks in livestock, adverse impact on the environment from the emission of greenhouse gasses by the livestock and innovations in animal husbandry such as encapsulation of acidifiers are the major driving factors for this market. On the basis of type, the global market is segmented into flavors & sweeteners, minerals, binders, vitamins, acidifiers, antioxidants, and others (feed PAA, enzymes, probiotics, prebiotics & complex carbohydrates). The flavors & sweetners segment accounted for the largest market share in 2015, followed by minerals. The acidifiers segment is projected to grow at the highest CAGR during the forecast period. The swine segment, on the basis of livestock, is projected to grow at a significant rate during the forecast period. With increase in pork trade and concerns over food security, the demand for specialty feed additives is expected to increase to ensure better meat quality and safety. On the basis of form, the specialty feed additives market is segmented into liquid, dry, and others (pellets and dust/powder forms). The liquid segment is projected to grow at the highest CAGR during the forecast period. Liquid specialty feed additives are gaining popularity because of their low cost. On the basis of function, the specialty feed additives market is segmented into gut health & digestive performance, mycotoxin management, palatability enhancement, preservation of functional ingredients, and others (greater dry matter intake and increased capacity for nutrient absorption).Palatability enhancement is projected to be the fastest-growing from 2016 to 2022. Palatability enhancement of the feed leads to high feed intake by the livestock. Thus, it is gaining a substantial position in the specialty feed additives market. The Asia-Pacific market is projected to grow at the highest CAGR during the forecast period, owing to the increase in demand for animal products. Growth in population, rise in disposable incomes, progressive urbanization, and increase in demand for quality meat products have driven the market for specialty feed additives. Growth is majorly witnessed in China, India, and Japan, owing to increase in the purchasing power of the population. The major restraints of the specialty feed additives market include harmful effects of rising operational & raw material costs, and inconsistency in regulatory structure. The specialty feed additives market has a number of large and small-scale firms. Agreements and investments were the key strategies adopted by market players to ensure their growth. Players such as BASF SE (Germany), Evonik Industries (Germany), Novozymes A/S (Denmark), Nutreco N.V. (Netherlands), and Alltech Inc. (U.S.) collectively accounted for the largest share of the specialty feed additives market.